Finally, I am fulfilling a promise I made to those of you who requested that I make a detailed post on how I buy US stocks. Thanks for your patience and the blog post idea. 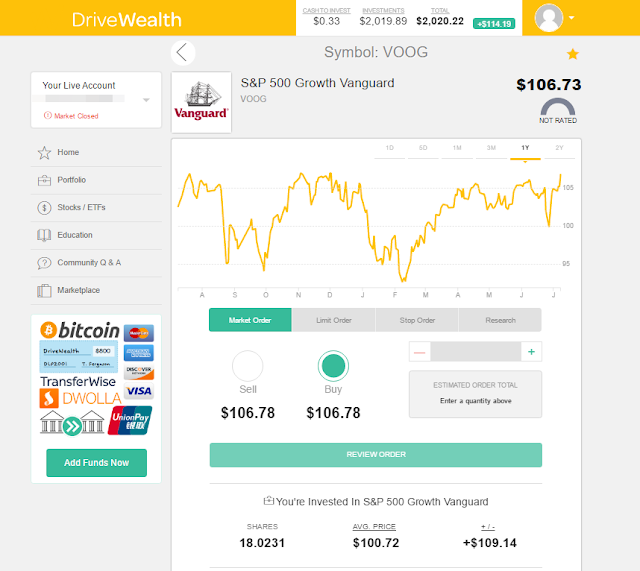 I use www.drivewealth.com It is founded by some US investment banking veterans to make investing for young people easy and fun, and to make foreigners be able to buy into the very US companies dominating their local markets. Opening an account is super easy. Unlike the other brokers I tried, they don't bog you down with requirements that only US citizens or immigrants can meet. You provide a valid means of ID, preferable National Passport, and fill a regular KYC (know your customer) form. And that's all. They review it and after a couple of days they get back to you about the status of your account opening request. If all goes smooth for you and your account opening request was granted, then welcome to an expanded world of investment. You can fund your investment account via your debit card, PayPal or Wire Transfer. I use debit card and PayPal. Using their online investment platform is very easy, and they have an excellent phone app too. So how do you get your money out? Through Wire Transfer or PayPal. But for me and most other Nigerians, it's only Wire Transfer we can use as PayPal doesn't yet allow us to receive payments. As a warning, I haven't yet withdrawn from the investment account so I can't say if getting your money out is easy. So you might want to do your own checking/research before deciding to use them. As per my investment strategy, I invested in S&P 500 Growth Index tracking Exchange Traded Fund (Vanguard's) and recently bought into an ETF that invests in Oil Exploration, Production and Refining companies because I know that the oil price won't be this low forever and those oil companies are already exploring ways of outliving Oil. The Nike shares you saw in my portfolio are a gift. Where do I get the money to fund my investment account? Money from my Amazon book sales; money from my online Excel training course sales, money from Google Adsense and money I earn from Upwork. How long have I been using this investment broker? I started this year, I think February or March, after I got severely burnt by Forex Trading and Binary Options Trading. I didn't want to converting my dollar incomes to Naira at the ridiculous exchange rate, so I decided to start investing in US stocks with it. Hi Michael, this is quite interesting but recently drive wealth seems to have stopped accepting Nigerians as it when I registered and contacted them. It's sad. I contacted them and they said we came up as a high risk country in one of their latest security audit so they took us out. They were kind though to let all those registered from Nigeria before the audit to keep their accounts.